Established in 2008, Be Green Solar specialises in the design and installation of solar, wind and micro-hydro renewable energy systems for Non-Governmental Organisations. The company was recently commissioned to improve the control systems of several solar plants in Haiti - a region left devastated by Hurricane Matthew which passed over in late 2017 leaving many towns and villages in the area badly damaged. The NGO commissioning the work operates two clinics, each with its own solar power plant. Clinic 1 provides general medical services and residences for the local administrative staff and Clinic 2, located 880 metres away, provides services principally for women. At each clinic is a 48kW solar power plant consisting of 148 solar panels, 10 DC-to-AC inverters, a battery bank and backup generator. Whilst each plant had a browser-based control interface, it was too complex for non-technical staff and a simpler system was needed. This is where the PanelPilotACE came in. The Site Administrator resides in Clinic 1 but also needed a means to monitor the local system in Clinic 2 as well as control the generator at the second site. The monitoring devices had to be simple; resettable visual and audible alarms, controlled by touching icons on a meter display. Similarly, the system had to use the existing wide-area network (WAN) connecting servers in each clinic. The monitoring system had to display the following information: Voltage of the main battery bank; charge mode of the battery charger (essentially the absorb mode of the batteries); generator running status; and alarm status and control (execute an audible and visual alarm when the state of charge of the battery bank dropped to or below 55% of full charge, visual alarm icons would continue until the generator was started or the batteries reached 95% of full charge). 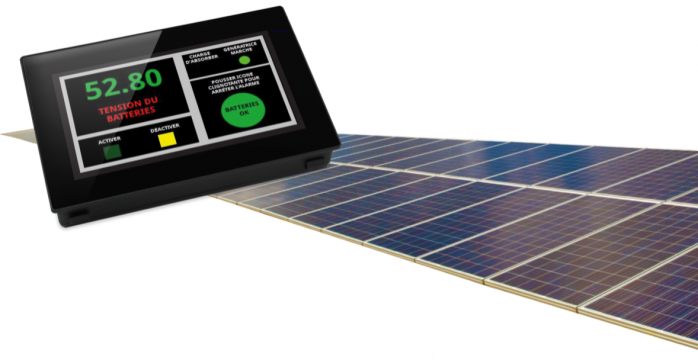 Be Green Solar selected the PanelPilotACE touchscreen display for the project. As well as the necessary analogue and digital I/O, the display included a programmable touchscreen interface easily customised with specific graphics and function buttons using Windows-based drag and drop software. Separate programmes were created for control panels in both clinics and verified using the display software’s simulator mode. Additional external circuitry was created to provide the audible alarms, power supplies and the peer-to-peer equipment necessary for the Clinic 2 system to function via the existing wide-area network. The primary function of each monitoring system is to alert a user if it’s necessary to start a standby generator to charge the main batteries. When the main battery bank charge drops to an unacceptable level (55% or below), this is communicated to PanelPilotACE, which responds by changing the “Batteries OK” green circle to a “Start Generator” flashing red alarm symbol. This is accompanied by an audible alarm provided by other hardware. The user can then press the alarm symbol on the touchscreen to deactivate the alarm and start the generator. The PanelPilotACE SGD 43-A display is an ideal device to create a customized display for virtually any project. For this Haitian project, we were able to provide a device that can be operated by simple touch screen icons, which requires little technical knowledge. Programming was a bit daunting at first, but became rather intuitive after one is familiar with the features available and how to access them. The software allowed all functions to be seen and operated in a simulation mode, which was extremely helpful when trying various functional combinations.